In the late 1980s and beginning 1990s, one of ART+COM‘s main research endeavours was the development of a net-based information system for urban planning. The research program was commissioned by DeTeBerkom who were looking for future applications and uses of the projected broadband network. The multi-part system was designed to serve architects, urban planners, engineers and public administrations collaborating in urban planning projects, providing them with all available data on a project or area, including 3-D realtime visualizations and process simulations. The system was aimed at simplifying and advancing decision processes for those not working in the same place, but on different aspects of the project. Within the research project “New Media in Urban Planning”, ART+COM developed a net-based image database accessible to every stakeholder in the planning process. 3-D visualizations and simulations should help to understand the status of the existing development as well as alternative versions of the urban planning project. Key factors to urban planning such as noise, traffic, light and shadow, air pollution and flow of air could be calculated and simulated. Later on, the system was used for a real urban planning project: the visualization and simulation of the new government district in Berlin which became necessary due to the government‘s move from Bonn to Berlin. The interdisciplinary team of ART+COM participated in the international competition for the urban planning of the Spreebogen area, where most relevant governmental and parliamentary buildings were planned to be built. ART+COM‘s radical proposal was to raise an artificial island in the Spree onto which the main edifices would be erected. The system was used for the design development and its three-dimensional visualization. Competing with over 800 submissions, ART+COM‘s design made the 10th place and was acquired. 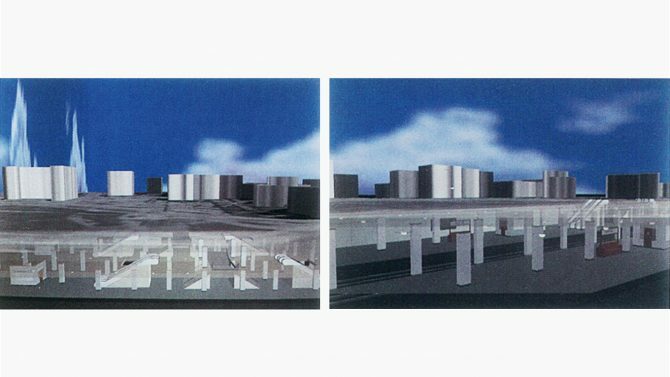 After the competition, ART+COM integrated the first two winning designs into the virtual city model. They were presented at the CeBIT 1993 in the form of a stereoscopic projection, and the presentation was streamed from Berlin to Hannover via broadband. A presenter stationed in Berlin was recorded by two stereo-cameras. His live image was integrated into the virtual model. Using a joystick for navigation, he guided CeBIT visitors equipped with polarization glasses through the virtual city of Berlin. He was joined by a second presenter located in Hannover who could also move through the virtual model. In this way, the first telematic meeting between two remote people took place in a virtual world that could be experienced, changed and constructed together. 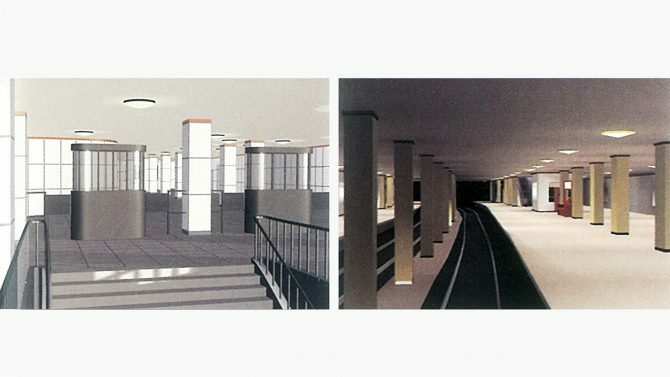 Moreover, a net-based virtual platform was developed for the redesign of the Potsdamer Platz subway station which had been locked down in 1961 with the construction of the Berlin Wall. Architectural plans, images, texts, films, videos, and computer animated visualizations of the area were made available in the virtual model. ART+COM also developed a Radiosity Rendering programme for the 3-D simulation of complex and changing light situations. In contrast to conventional computer animation systems, the programme was based on the polygonal description of a place and its luminous surfaces, so the transfer of light from one polygon to the next could be calculated. Hence all grades of light in a room and in relation to all possible perspectives could be simulated. These light simulations were particularly realistic due to the computation and depiction of soft shadows and reflective surfaces. Jaron Lanier‘s company VPL Research sold the software license in agreement with ART+COM until 1993.